Do you hear the rallying cry of God’s trumpet call across the earth? May all who have spiritual ears listen up. Angels and heavenly beings’ armies along with men, women, and children of faith are marching to the cadence of the roaring vibrations of heaven. As heaven invades earth and the highway to heaven (Isaiah 35:8) is going up, the volume of the sound of many ‘boots on the ground’ grows louder and louder, and the rhythmic pace in lockstep unity quickens into a martial array. (Strong’s Hebrew: 2571. 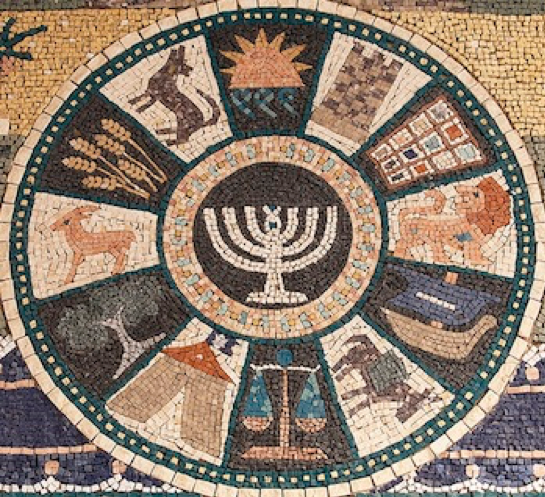 חֲמֻשִׁים [chamushim]). Globally, doers of the faith, not just hearers, are entering this new year with fresh anticipation, renewed youth like the morning dew, as we read in Psalm 110:3, brimming over with child-like faith and maturity, in awe of our Lord. Their eyes are bright, as the glory shines dazzlingly with heaven’s hope, even as the earth trembles and shakes violently and darkening evil expands. Heaven suffers violence and the violent take it by force. (Matthew 11:12) I heard the Spirit of the Lord say there is a fresh revelation on this holy violence fought in the Spirit. There are many levels this spiritual violence is at work in. We truly have to ‘get over ourselves’ to advance. The Lord trusts us to rise above our past and gives us His heart and Holy Spirit solutions to ignite His fire inside each one of us and heal our old wounds. We will look shortly in this article at how the Holy Spirit prepared the followers of Jesus and mended the wounds of those waiting in the Upper Room, so they could have the power to advance and even to see Peter go right out and win three thousand souls to the Lord. The weapons of our warfare are not carnal, but spiritual for the pulling down of strongholds. (2 Corinthians 10:4) Heaven suffers violence and the violent take it by force. How do we impact change and usher in revival or national transformation? First, we must personally undergo extreme and total surrender and yielding to the Holy Spirit in order to truly be new creations in Christ. It is not by being politically correct nor by seeking to gain popularity or pleasing men. This year, I see many people questioning themselves if they are really saved and praying the salvation prayer in earnest and many others praying and rededicating their lives to Christ. This is healthy and needed. There is a spiritual congruency that releases the vibration from heaven: when our character foundation is strong, we remain teachable, humble, single-minded, submitted to worthy spiritual authority, and our faith, words, and actions line up with the integrity of Jesus Christ, the Author and Finisher of our faith. (Hebrews 12:2) We are called to walk in the fullness of joy and His joy is our strength, and when trials come, we can rejoice while pressing into the heart of God and by knowing Him in an intimate and personal way. Not just knowing about God but stepping into His righteousness, rather than in our own ‘filthy rags’ kind of rectitude. Our job is to help them fulfill their destiny as deeply and quickly as possible, knowing their identity in Christ. We are striving to help them grow in their calling and their election made sure, in order that they will not fail nor fall away. 2 Peter 1:10 confirms this saying: “Therefore, believers, be all the more diligent to make certain about His calling and choosing you [be sure that your behavior reflects and confirms your relationship with God]; for by doing these things [actively developing these virtues], you will never stumble [in your spiritual growth and will live a life that leads others away from sin]”. It’s time to keep standing! We are so thankful for the Lord’s grace and His word in building authentic, genuine relationships rooted in the love of Christ, above every other spiritual gift. In this season of global calamity, the chasm is growing between those in ministry because of a genuine call and those who are just pursuing it as a job. There is a falling away, even a great apostasy coming and increasing, as it is written, and it’s now upon us as frictions, fake news, global media mind control, economies’ and nations’ shaking spread. Our carnal intellect, ‘self-agendas’, and material distractions along with western Laodicean or ‘lukewarm’ Christianity doesn’t work, does it? How do we advance in our wielding our spiritual weapons? This is absolutely essential for us to reach the lost in all seven mountains of society with the hope and light and solid truth the Lord gives us for our own survival, as well as for any possibility of thriving in fullness. The stakes are high, not just for our own families’ lives but now clearly even to save nations like the USA from destruction. We must overcome darkness with the light of truth and the love of God. The work of the Father is to help us believe. Lord, help us believe the way you created us to believe. Every Cell In Our Being Touched By The Holy Spirit! In Webster’s 1828 Dictionary we find ‘diffused’ means “spread; dispersed. loose; flowing; wild.” Jesus was wild in His obedience to His Father. Being really filled with the Holy Spirit as they were in the Upper Room means every cell in our being is touched by the fire of the Holy Spirit. Our mind, will, emotions, our spirit-man, even our soul being touched, illuminated by God’s light and truth, cause the healing of each and every wound; emotional, financial, familial, mental, all of them. Every offense or sign of the old man is healed in such a way that even Peter, who had been called ‘satan’ by Jesus Himself and who denied Jesus three times in just a few hours, could be so changed and empowered by the Holy Spirit that he went out shortly afterward and won over three thousand souls. Lord, we need that touch! Lord, we want it all! Help us, Lord! Show us what we need to do in our lives to get to that point of encountering and witnessing the power of Your love and the Holy Spirit power. The Ancient of Days invites us to receive His revelation by joining Him in heaven to view this scripted masterpiece of your life. (Revelation 4:1) Are you ready? By Jesus’ blood spilled for you, you have access behind the veil. (Hebrews 4:16) Will you go? Will this be your year for going in more than ever before? Given a new sword and seeking a sharper focus at CMM in this new season the Lord is showing us fresh ways of how we can connect and strengthen as we anticipate and see more fruit with our network friends, our family, in the nations as we align with heaven for the glory of the Lord. Everything in every sphere in the world is changing fast. We sense a real acceleration in available revelation and grace from Daddy to be more and do more to prepare ourselves, the Bride and the Body for what lies ahead. Sidney and Helen Correll were loving visionaries raising up nationals in many nations to reach their own people for the cause of Christ. Many of our leaders and staff have grown in their hunger and realization of the necessity of knowing his voice and discerning the times as read about in the ‘sons of Issachar.’ We have been blessed to see tremendous growth at CMM in hearing the voice of our Shepherd without losing the vital, preeminent ‘love’ factor the Apostle Paul speaks about 1 Cor 13. Missionaries are called to be ‘flames of fire’ everywhere we go. We are called to be humble and life giving-speaking ambassadors of Heaven. Some missionaries fall into a thing of ‘false humility’ and that’s when we get into danger. We are called like the Apostle Paul says, ‘to be all things to all people in order that may win some.’ Knowing our identity in Christ and that we are seated in heavenly places with Christ Jesus gives us faith and courage to go beyond the veil into the throne of grace to get help, mercy, and grace in time of need. Heb. 4:16. But, we must walk out with all the authority we have been given by Christ our Lord. We want to bring joy every day to our Father’s heart and real, lasting relationships are built on mutual respect, honoring each other and trust that lead to an authentic, vibrant, organic, Spirit-led life in Christ. CMM-Equipping the local church on a global scale. CMM is Building and Strengthening the Net globally. Recently the Holy Spirit has been giving me more clarity on what some of our next steps are to be. We are thankful and really blessed with deep and trusted friendships with truly amazing and anointed leaders on fire for God, who have gotten closer with us on life-changing mission trips and in our CMM College of Theology. The Lord gave me a name for this new, focused initiative-The Council of Issachar. We have heard many teachings about the sons of Issachar and discerning the times, but let’s not forget their ‘father’ Issachar himself and what transpired in his life to make the way for his ‘sons’ to be so blessed. We all want our children, natural and spiritual to go beyond us in every area. The Word says we have many teachers but not many fathers. Often real, godly fathers are the best teachers. Chuck Pierce writes this: “Issachar was the ninth son of Jacob and the fifth son of Leah. The tribe of Issachar was positioned strategically with Judah and Zebulun (Numbers 2:5; 10:14-15). Zebulun, the tenth son of Jacob and the sixth and last of Leah, meant “dwelling, habitation.” Zebulun was the tribe of war, ships, and trade. Judah was the fourth son of Jacob and Leah. His name meant “may He [God] be praised.” Judah prophetically was always destined to go first as the warrior tribe that would conquer. Much can be said about Issachar the father of this tribe. He had a governmental anointing. He was a burden bearer, compared to a donkey. A donkey was often used to guard the sheep, as it needed little attention or care from the owner. It didn’t take from the sheep or harm them and needed little supervision to fulfill its assignment. Issachar was known as a real scholar of the Torah and the tribe of Zebulon was strongly connected with them supplying funds to the tribe of Issachar for their scholarly pursuits and thus the 200 ‘sons of Issachar’ became leaders in the Sanhedrin. These sons are watchmen over the sheep. Their father, Issachar was able to bow his shoulder and serve as the burden bearer for future generations. Joe Shrewsbury adds: “Donkeys are also known for bearing burdens. This speaks of intercession. This is not the stereotypical intercession that consists of requests and petitions before God, but acts of intercession. Just as the donkeys attack the coyotes and wild dogs who attack the sheep, the sons of Issachar are responsible for actively engaging in warfare to protect the body of Christ. When the predators are too big, the loud braying of the donkey alerts the Shepherd to get involved. This is similar to CMM in the 21st century in watching over and caring for the fullness and completion in all those we minister to in the nations. Col. 2:10 is what the Apostle Paul wanted to see in each one he ministered and raised up, that was ‘to see everyone complete in Christ.’ Holiness is essential. Every person is a unique creation of the Lord and his desire is for us to be ‘our selves’ as in that we each are fearfully and wonderfully made, conformed to the image and DNA of Jesus Christ, not mere men. Because of the anointing the Lord put on the father, Issachar, his sons were given their anointing to discern the times and seasons. So too, CMM is called to provide a broad spectrum of ministry services: love, the Father’s heart, revelatory education, Kingdom worldview, humanitarian aid, love of Israel, stopping human slavery, safe water, hygiene training, caring for widows and orphans, sustainable agriculture and community development etc to our Missionaries globally. We seek growing intimacy with our Daddy so we may be able to lead others into heavenly encounters aligning ourselves with the Lord of the harvest for the end times. The ‘sons of Issachar’ prophetic anointing is one of the callings CMM is appointed to equip and release to establish and strengthen the ‘net’ globally. In addition to the prophetic ministry, CMM provides there are all the rest of the five-fold ministry gifts at work to impact and transform individuals, students, graduates, and the lives of those in the many house churches, schools, congregations, businesses, communities and movements in the many nations we sow into. How Will The Council Of Issachar Work? Teams serving on the Council of Issachar will pray for and minister, often in online video conferencing to a region, ministry leadership, or a topical theme, depending on the focused need. Anointed men and women will be asked to pray and seek the Lord for wisdom and prophetic insight and speak the word and heart of the Lord to recipients in the nations. Team members will come from our friends who are available at that time and have a heart or special word from the Lord for the people receiving the council or the topical theme or purpose of the call. Follow up will be allowed to be organic and free as the Spirit leads so team members may rotate in and out depending on availability and being led for each call by the HS. Relationships can organically develop and team members will be welcome to conduct for further follow-up, training, impartation or possibly visit that nation for conferences, in-depth training, prophetic summits and fellowship. Leah’s fifth son, Issachar, embodies the notion of the reward that comes from hard work. 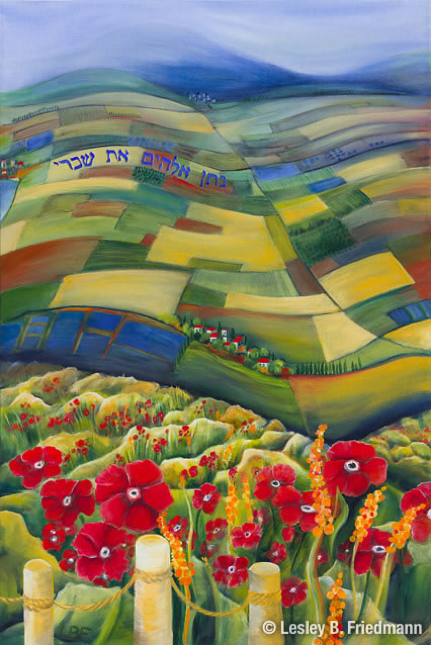 The painting takes us to the Jezreel Valley in the north, where the quilted landscape shows the lush reward of the pioneers and farmers who labored to transform an arid land into a productive one. The valley unfolds before us like a scroll or a book, mirroring the role of the tribe of Issachar as Israel’s scholars and educators. Through the labor of Torah study, we harvest the richness of G‑d’s wisdom, which provides us with guidance, sustenance and direction, allowing us to see far into the peaceful distance. The deep blues of the painting reflect Issachar’s gemstone, sapphire, which was also the material from which was carved the Tablets of the Ten Commandments, the Divine source of our wisdom and scholarship. 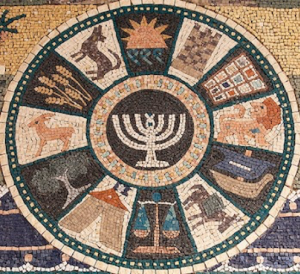 The Twelve Tribes of Israel-Issachar is represented as the donkey. Issachar is a strong donkey, Lying down between two burdens; He saw that the rest was good And that the land was pleasant; He bowed his shoulder to bear a burden, And became a band of slaves. 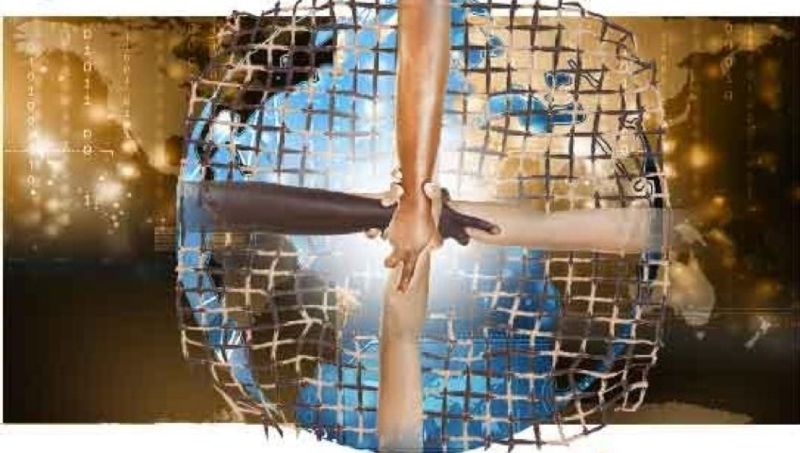 We See In Part…95% of the matter in the universe is invisible and unknown to us.1 Corinthians 13:9-12 New King James Version (NKJV)9 For we know in part and we prophesy in part. 10 But when that which is [a]perfect has come, then that which is in part will be done away.11 When I was a child, I spoke as a child, I understood as a child, I thought as a child; but when I became a man, I put away childish things. 12 For now, we see in a mirror, dimly, but then face to face. Now I know in part, but then I shall know just as I also am known. 95% of the matter in the universe is invisible and unknown to us. All we know about the universe is from the 5% of the total. The Word unlocks many mysteries and reveals even more mysteries we are yet to know or understand. Through Jesus’ life and words and example, we are given access to explore what is unseen, eternal and true. How humbling it is to know where we are now and the unfathomable riches he holds for us to truly be like Him. See 2Kings 6:15-17 Elisha asks the Lord to open his servant’s eyes2 Kings 19:35 185,000 Assyrians and Angels. As you study the Word and the supernatural life Jesus gives us allow the faith keys and revelation the Lord gives you to ignite your hunger and desire to know and receive all He has for you in your studies to show yourself approved.2 Timothy 2:15 New King James Version (NKJV)15 Be diligent to present yourself approved to God, a worker who does not need to be ashamed, rightly dividing the word of truth. We know each moment contains a pathway and invitation to eternity. Our aim is to choose wisely to balance both the “busyness” of today and the focus of our attention on how we can align our lives with the Lord, our true compass. Recently, in my morning quiet time on my back porch, the Holy Spirit zoomed me in to see the minute arteries of nearby leaves and the intricate details of a feather. It is very easy to get too busy and distracted with our many tasks. We all love children, especially our own. Our Father God created each child as His own supernatural gift of love. The Lord created the family as the best way to ‘train up a child in the way they should go.’ (Prov. 22:6) According to UNICEF (The UN Children’s Emergency Fund) there are one hundred fifty-three million orphans worldwide. If orphans were all in their own nation it would be the ninth largest in the world, bigger than Russia. Wars, violence, AIDS, disease, abandonment (sometimes due to a child being the wrong gender), broken homes and more are all fruit of man’s fallen nature. “Honor, Discipline, and Loyalty”—these words on a sign in front of a military base north of Quito, Ecuador struck me like a heavenly tuning fork. We went to Mitad de Mundo, the middle of the world, on our way to Mt. Zion to visit a church on the equator at zero latitude. We have much to do, or “undo,” in our own yielding to prepare the Lord’s bride. As we align our lives with the Lord, become one with Him (see John 17), and walk in the authority Jesus has given us, it is good to acknowledge that we have not yet arrived. 2017 was a challenging yet exciting year for Eagle Missions. Thousands were saved and new churches were planted almost weekly, and we continue to share resources from Rick Joyner and MorningStar with hundreds of key leaders in many nations. We are so thankful for our Partners, volunteers, and intercessors who work valiantly to build and strengthen deep relationships in our global community. 2018 is the year for taking even more risks by faith and seeing with His eyes. Do you feel the winds of change shifting again? We choose to focus on the great hope we have in the Lord and many opportunities to shine in spite of the increasing darkness. There are many efforts from the enemy of our soul that are ‘boomeranging’ back on the sender’s head as he sends his bad winds on many fronts these days. We have to deal with a glut of global mind control, fake news, whacko despots, religious spirits, political correctness etc. The shaking will intensify. In Hebrews 12:27 we see this “Now this [expression], “Yet once more,” indicates the removal and final transformation of all those things which can be shaken—that is, of that which has been created—so that those things which cannot be shaken may remain.” The winds are blowing and winds are shifting. Yet, there is one wind we do not want to miss. That wind is the wind of the Holy Spirit. What are you dreaming of? Imagine riding a horse in Cuba in the 1940’s dreaming of a nation awakening to their true identity of who Jesus is and wants to be for them. As Sidney Correll rode on horseback to the top of a high hill covered in sugar cane overlooking the ocean near Las Palmas, about an hour and a half west of Havana. Sidney had been asking the Lord for the place where he would build his first church and training center anywhere. Just as he looked down at the beautiful blue ocean and the bay the voice of the Lord spoke to him telling him “If you ask the man who owns that land to sell it he will agree.” He rode his horse down the hill on a dirt path to ask the man and he said ‘yes’. “Watch this!” the Holy Spirit said. That voice always gets my attention. He gave me a vision and showed me massive throngs of people from many nations walking—more like floating—into heaven’s marvelous light.